A few weeks ago, while struggling for new recipe inspiration, I received a tweet from Lucas (aged 6) from @KidGLloves to say how much he liked our creations. I decided to ask him what food he loves so that I could come up with a dish he would enjoy cooking for his family. His said his favourite foods are pizza and fish, specifically cod and trout. Keen for a challenge and liking the idea of getting children to eat more fish (anyone remember the Sardine Couscous?) , I decided against pizza and to focus on trout. 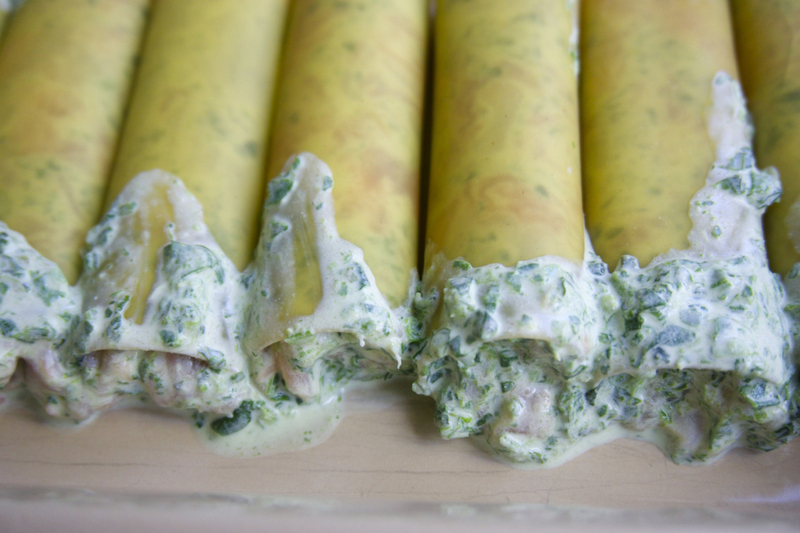 Lucas is 6, but a toddler would be able to make this Trout Cannelloni too. A very young toddler might need some help taking the skin off the fish. If you can't get boneless fillets, then don't worry, it is easy to pull trout bones out, but probably best done by you beforehand to be sure of a thorough job. If you don't want to use spinach, it also works well with cooked broccoli (mashed with a fork) or grated courgette. Regular readers know the drill. These are all the bits you need to get sorted first so that, when the little chef gets cooking, you can just let them crack-on; no interruptions, no waiting. 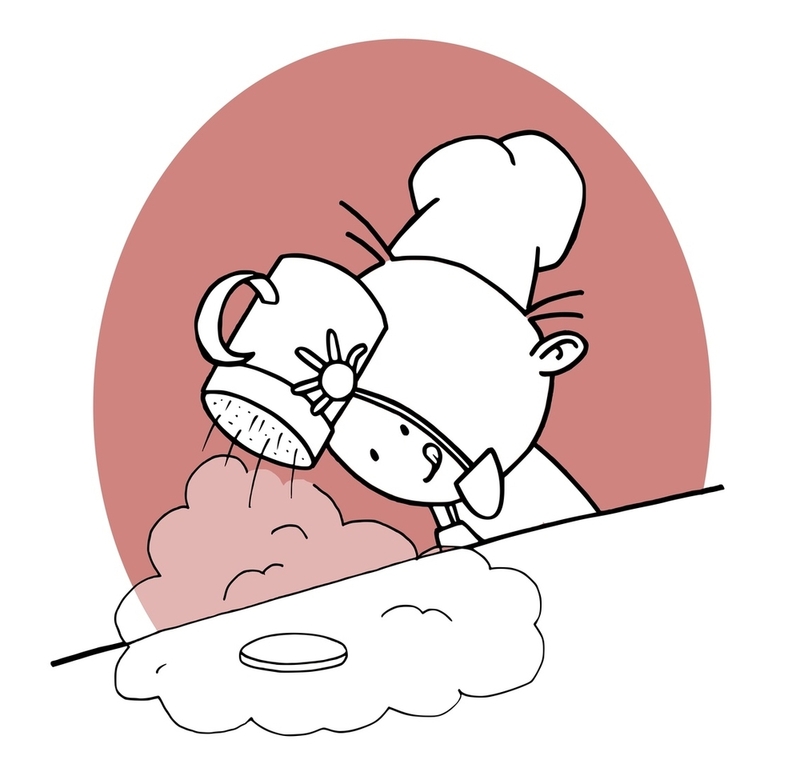 It helps to keep them engaged and to feel like they're cooking largely independently. 1. Preheat oven to 180C/350F/Gas 4. 2. Defrost the spinach and drain off liquid. 3. Finely chop parsley. Or, if you want your child to be able to do it themselves, use a rotary herb mill. 1. Put the cream cheese, 2 tablespoons (about 1/3) of the creme fraiche, spinach, parsley and some salt and pepper to season into a mixing bowl and mix. 2. Pull and tear the fish off the skin and into little pieces. If there is any remaining fish on the skin, scrape it off with the table knife. Put the fish into the bowl and mix. This is hands-on cooking in it's truest sense. Make sure they've washed their hands thoroughly beforehand. And be ready to run their hands under cold water when they've finished. Use cold water, not warm because warm water ingrains any fishy smell into hands. Don't worry if they get quite rough with the fish; they need to. I know many people are squeamish about handling raw fish and I understand why. If you are, try not to let it show so your little chef doesn't pick up any negative vibes. The bonus about being so hands on with the fish is that you are more likely to find any rogue bones The odd bone can sneak through, even with boneless fish, so check. 3. Stuff the fish mixture into the cannelloni tubes. The best way to do this is with fingers so be ready to rinse hands again afterwards. Poke mixture right the way through until they are completely full. Concentrate on getting all the fish into the tubes. Lay the tubes in the oven-proof dish. Don't worry about having mixture left over; you should. 4. Mix the remaining 4 tbsp of creme fraiche and 1/2 the parmesan into the left-over mixture. Spread onto the cannelloni tubes. 5. Sprinkle the top with the rest of the parmesan. Bake in the oven for 15 minutes. Remove the foil and bake for a further 15 minutes until cheese is golden. Click on image below to save onto computer or device to keep or print. Note: resize the image to fit paper size in your print settings otherwise it will print too small.